Posted on Jan 4, 2018. 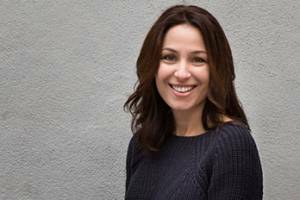 Manoush Zomorodi, host of WNYC Studios podcast, “Note to Self”, TED speaker and author of “Bored and Brilliant” will be one of the 2018 keynote speakers. Registration now open for March 8, 2018 Leadership Summit featuring global thought leaders in collaboration, unlocking your most productive and creative self, & leading Gen Z. Lock in discounted rate for your team – Send your team of 5 or more and receive discounted group rates for Leadership Louisville Center’s fifth annual Leadership Summit. Contact us for details. With the theme Leading in the New World of Work, the Leadership Louisville Center’s fifth annual Leadership Summit is designed to offer a fresh look at leadership in an ever-changing world. Presented by sponsor PNC Bank, the day of learning on March 8, 2018 will feature keynote speakers and interactive workshops providing insight and actionable takeaways for leaders at all levels. The hundreds of attendees represent the top leadership from Louisville and the surrounding region, ranging from high-potential emerging leaders to C-suite executives. Manoush Zomorodi, a podcast host, TED speaker and author of Bored and Brilliant: How Spacing Out Can Unlock Your Most Productive and Creative Self. She has helped tens of thousands reclaim their time and will share how to cut through information overload and discover the magic of clearer thinking. Marcie Merriman, a globally recognized leader in cultural anthropology and brand strategy currently leading EY’s Digital Practice and is Executive Director of EY Columbus. She is a sought-after media commentator and research contributor to the best-selling book The Myth of Excellence, which details consumer motivation and corporate strategic response. James O’Connor, head coach of Louisville City FC and former professional soccer player. Walter Woods, CEO of Humana Foundation. Additional breakout session speakers are: Busy Burr, Humana Inc.; Scott Colosi, Texas Roadhouse; Roger Cude, Humana Inc.; Norris Hamilton, Horseshoe Southern Indiana; Dave Hare, Trilogy Health Services; Ryan Parker; Yamilca Rodriguez, Louisville Bespoke; Craig Stein, Mirazon; Cynthia Knapek, Leadership Louisville Center; and Lisa Zangari, Leadership Louisville Center. FirstBuild and Amazing Robot & Sons will host special interactive exhibits for attendees. View event schedule – agenda details are below. The 2018 Leadership Summit will be hosted at The Kentucky Center for the Performing Arts, 501 W. Main St., Louisville, KY, from 8:30am-5:30pm on March 8, 2018, and will be attended by hundreds of regional business and community leaders. See video highlights from 2017 Leadership Summit. Registration is now open at www.leadershiplouisville.org/our-events/leadership-summit/ – REGISTER NOW. Individual tickets are $450; patron sponsorships that include tickets for five individuals are $2,000. To learn more about special group rates and sponsorships, contact Jennifer Stevens, jstevens@leadershiplouisville.org or (502) 561-5231. Special thanks to our event sponsors: Presenting Sponsor PNC Bank, Speaker Sponsor Humana Inc., Gold Sponsor EY, Silver Sponsors Business First, Extell Financial Services, Insider Louisville, Louisville Magazine, Louisville Public Media – WFPL, and MPI Printing. Leading at the Speed of Transformation Busy Burr, Vice President and Head of Healthcare Trend and Innovation, Humana, Inc. and Roger Cude, Senior Vice President of Human Resources, Humana, Inc. Created in 1979, the Leadership Louisville Center is the region’s most valuable resource for leadership development and civic engagement. Its mission is to grow and connect a diverse network of leaders who serve as catalysts for a world-class community through dynamic programming and strong community connections. Over 7,000 community leaders have graduated from the Center’s programs that include Leadership Louisville, Focus Louisville, Ignite Louisville, Bingham Fellows, and Encore Louisville. The Leadership Green Room was launched in 2015 and serves as the training and talent development arm of the Center, expanding the resources available to the region’s business community and employee base. In 2011, the Leadership Louisville Center was recognized as one of the top seven community leadership programs in the U.S. in a benchmark study by the Center for Creative Leadership, the “gold standard” global provider of executive leadership education and research. Learn more at www.leadershiplouisville.org.